We take our feet for granted. We stuff them inside sweaty socks for hours. We slide them into the most luxurious pair of high heels, push them up to unnatural heights, and make them stay like that for hours. On an average day, our feet suffer a lot of indignities and withstand a lot of pressure without any complaints. That’s why we need to show them some love. No, you don’t need an expensive spa treatment to show you care. These foot spas will help your feet feel good. 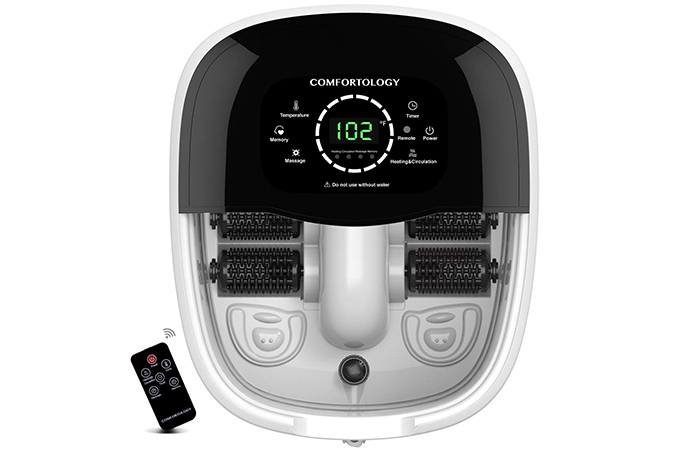 If your feet are craving for a deep and intense massage, try this product by Comfortology. It comes with motorized rollers that deliver intense massage to the strained muscles of your feet. You can easily control the intensity of the rollers. It has a precise temperature control feature that quickly heats the water and maintains it. It comes with a timer and a smart button that keeps a record of the settings so that you do not need to adjust it everytime you use it. 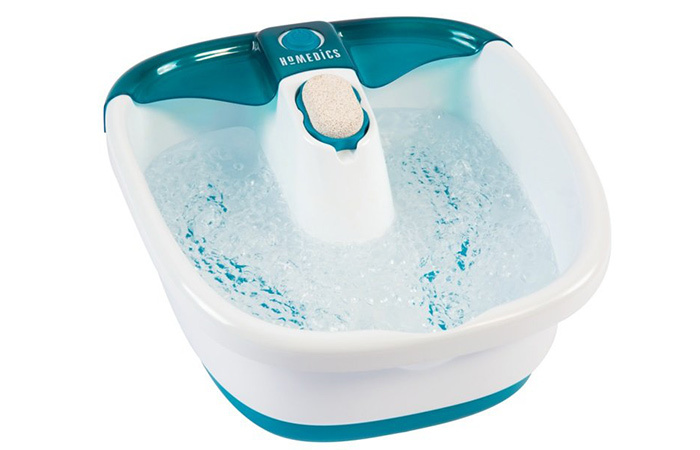 This is a multifunction foot spa and massager that is designed for those who are always on their toes. It delivers intense vibrating massage to tired feet and soothes aches or discomfort. The rollers boost circulation under your feet. It maintains the temperature levels effectively. You may add essential oil or Epsom salt for more benefits. 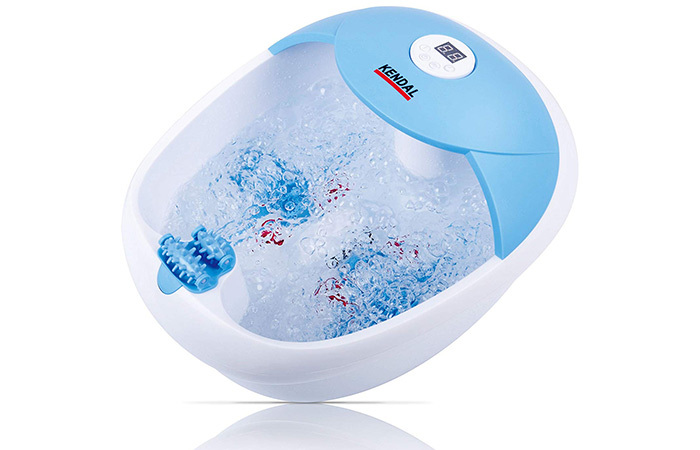 If you are looking for a foot massager and a foot bath, get your hands on this product. 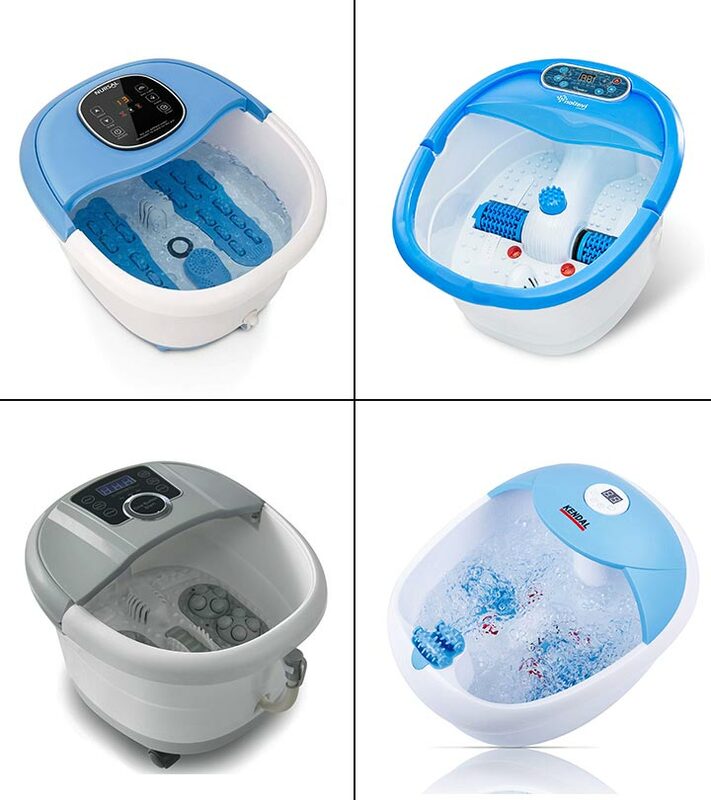 This is an all-in-one foot spa that provides both bubble massage and heat therapy to your tired feet. The temperature of the water can be controlled. You can even adjust the time for the foot massage with its auto-timer. Turns a bit wobbly if you remove the wheels. This product has a unique and effective heating system. The speed heating technology quickly heats the water and maintains it at a constant level. You don’t need to add hot water during the massage session. 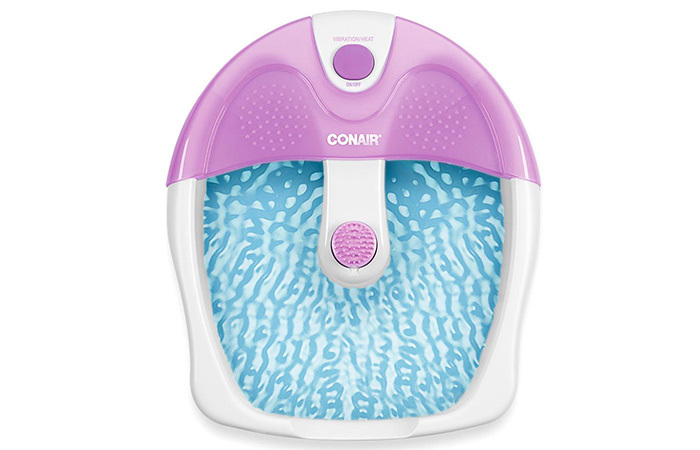 The oxygen bubbles help in relieving fatigue, and the 11 mini rollers give your tired feet a kneading massage. Bubbles are not very strong. The product claims to treat your feet with an invigorating bubble massage and soak all the tiredness from your feet. It contains raised nodes for a gentle foot massage. 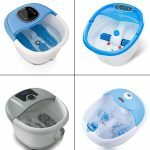 The best part is, it claims to maintain the water temperature and keep the water warm until the end of your massage session. 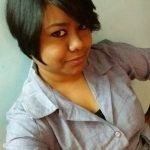 Cannot maintain water temperature for long. 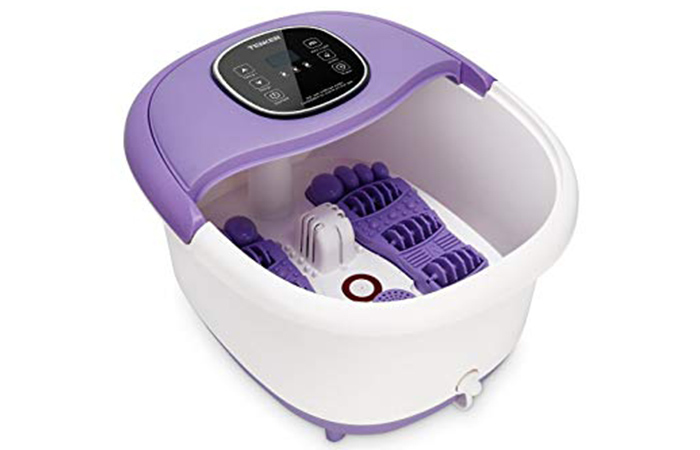 This foot spa and massager lets you control the water temperature and maintains it until you are done with your spa session. 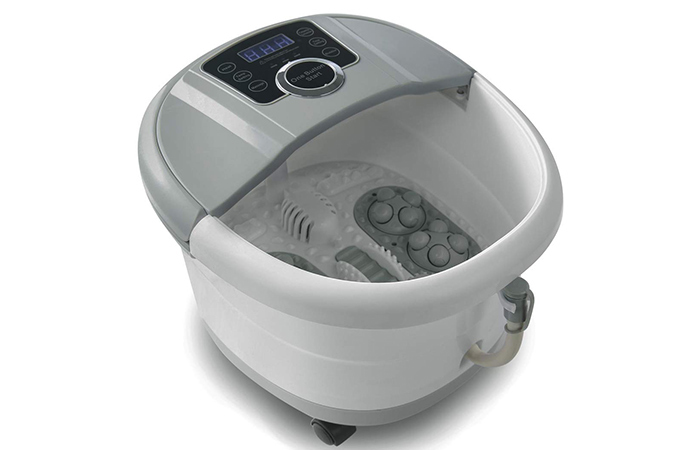 The bubbles feel extremely comforting on your feet, and the rollers give a deep tissue massage. It has 4 rollers that stimulate all the important parts under your feet. This foot massager has multifunctional features. 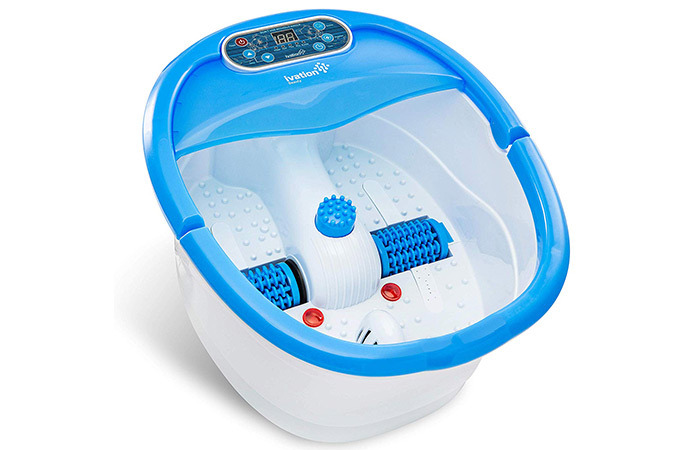 It has two rollers that massage your tired feet, and its intense vibration boosts blood circulation. The oxygenating bubble action helps relieve pressure and pain from your feet. 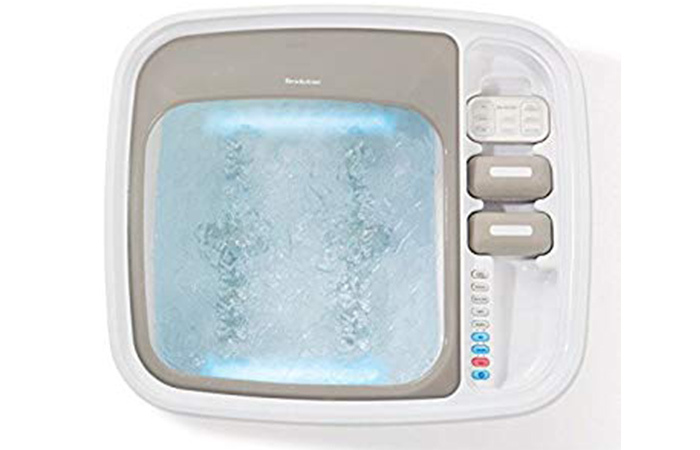 You can control the water temperature as well as the intensity of the massage. Accessories are not comfortable to use. This all-in-one product is easy to use and portable. The spa bath massager relieves fatigue from your tired feet, and the bubble therapy soothes them. You can set the temperature anywhere between 35o C and 48o C, and it will keep it constant. 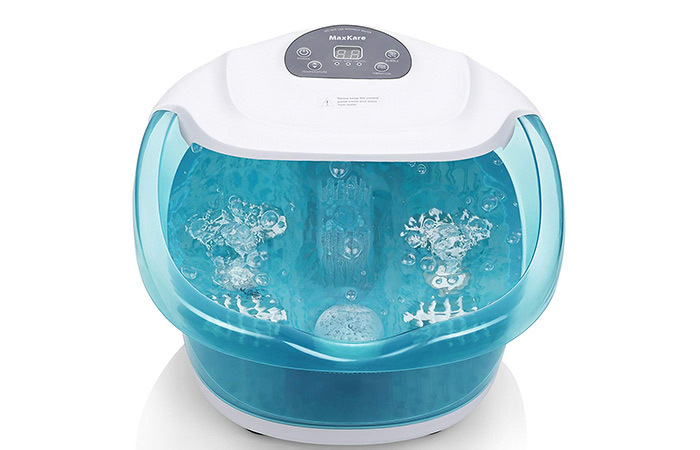 This bubbling and soothing foot spa come with three pedicure attachments and two bubble strips. These gently wash away the day’s tiredness away and help your feet unwind. It vibrates and massages your feet, giving you a spa-like experience. Issues with maintaining water temperature. Tired and achy feet? Not anymore – because this ultimate spa retreat can make them disappear in minutes. 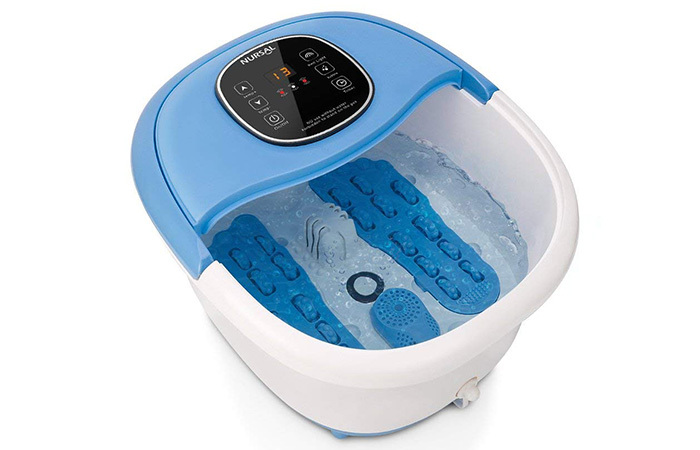 This foot spa and massager by Brookstone has water jets that massage your feet gently and relax the achy muscles. It has rolling nodes that knead the tired foot arches and stimulate the reflexology zones.